I like the work of David Mamet a lot. He’s a writer who knows how to write extraordinarily good dialog and no two characters in any of his works sound the same. His movies are enjoyable just to listen to, not to mention their complex stories and plots. I loved “House Of Games” which was about a psychologist delving into the world of con men and finding out she doesn’t know as much about psychology as she thought she did and I’ve seen THE SPANISH PRISONER twice now and you would think that after watching one time it would be spoiled for me but it wasn’t. Even knowing what was going on and how the movie ended I found myself still being totally engrossed in what was happening and I credit that to the meticulously crafted story and terrific performances. A lot of modern suspense movies are labeled ‘Hitchcockian’ but THE SPANISH PRISONER is one of the few that I can say actually deserves to be compared with Hitchcock’s best work. Joe Ross (Campbell Scott) is a brilliant scientist flown down to Bermuda with his partner George Lang (Ricky Jay) by their boss Mr. Klein (Ben Gazzara) for the purpose of giving a group of investors an update on ‘The Process’ Joe has invented. We’re never told what ‘The Process’ is and it really doesn’t matter. ‘The Process’ is the movie’s ‘MacGuffin’, which was Hitchcock’s term for whatever it was that got the plot rolling. The important thing we need to know is that ‘The Process’ is worth a whole lot of money. How much? We never find that out either but during the meeting with the investors, Joe writes a figure on the blackboard that we don’t see but the investors react as if they’ve seen Jesus bring forth Lazarus. Joe tries to engage Mr. Klein in discussion as to just how much of a bonus Joe and George can expect but Mr. Klein is suspiciously vague and just keeps reassuring Joe that he’ll be taken care of. 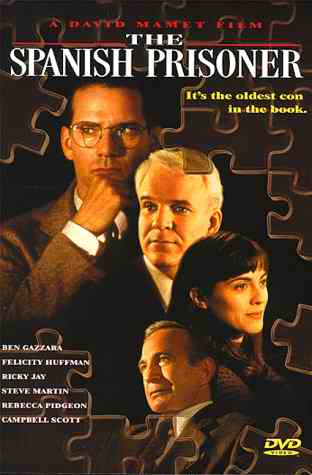 While this is going on, Joe is trying to puzzle out the really weird conversations his new secretary (Rebecca Pidgeon) assigned to him keeps initiating and he meets Jimmy Dell (Steve Martin) a New York businessman who is in Bermuda having an affair with his partner’s wife. Jimmy asks Joe to deliver a package to New York for him. The package is meant for Jimmy’s sister but as Jimmy says later on, that was just an excuse so that Joe could meet Jimmy’s sister. Jimmy likes Joe and thinks he’d be good for her. Problem is, every time Joe’s supposed to meet her, she never shows up. And while this may not seem like much, it proves to be very important later on. Because while the friendship between Joe and Jimmy grows in surprising ways, Joe is becoming increasingly dissatisfied with the way Mr. Klein is treating him and all these elements make up the first half of the movie which may seem slow and nothing much happens but you’ve really got to pay attention because the second half is where it all pays off. The problem with reviewing a movie like THE SPANISH PRISONER is this: everything depends on a first time viewer going into it cold, without having any idea of what it’s about because the story is put together so well that going into too much detail could unintentially spoil the experience of seeing it for the first time and I wouldn’t dream of doing that. THE SPANISH PRISONER is a movie made for people who love the kind of plot that demands your attention. It’s a thinking person’s suspense thriller and one you can’t shut your brain off on and coast along on autopilot. And if you watch it with somebody who insists on talking while watching movies, kick ‘em the hell out of the room. It’s not that kind of movie. You miss something and you’ve missed a lot. The performances are all absolutely first rate with Steve Martin easily walking away with the top acting honors. Steve Martin is so good in this that if I had watched this without knowing a thing about Martin’s history as a comedian, I would have taken him for a career dramatic actor. Yes, he is that good in this role. He plays it absolutely straight with respect for the story and the character and it works supremely well. Campbell Scott is an extremely appealing hero. He’s a genius, yes, but he’s also a bit slow and dim when it comes to dealing with people and he’s charmingly simple and uncomplicated. None of which helps him when he finds out what kind of shark pool he’s been thrown into and he has to smarten up damn fast if he wants to stay alive. Rebecca Pidgeon plays Susan Ricci, the secretary and it’s the quirkiest, most eccentric performance in the movie. She’s got an unusual way of talking and finishes her sentences as if she’s waiting to be patted on the head and told she’s a good girl. Some of her scenes were irritating and others downright strange but by the time you get to the end, they make sense. Ed O’Neal has a small but pivotal role. I was disappointed that Ricky Jay didn’t have more screen time but he makes the best of it, dropping several lines of beautifully quotable dialog such as: “Beware of all enterprises which require new clothes”. So should you watch THE SPANISH PRISONER ? I’d most certainly say yes if you’re in the mood for a brain twisting labyrinth of a thriller where nothing and nobody is as it seems with wonderful dialog and great performances. Turn your brain on and enjoy.